This Hokkien fried rice is simple to make with incredible ingredients, easily found on the menu of Hong Kong yum cha restaurants. To make fried rice is a good way to clear all the leftovers in fridge. It’s my family’s all-time favourite dish. Or to say, it’s my most favourite dish especially when I don’t feel like spending too much time in kitchen. It’s simple and could be finished on the go. Getting back to this popular Hokkien fried rice. That said it’s not originated from Fujian, yet you’d easily found it on the menu of Hong Kong yum cha restaurants. 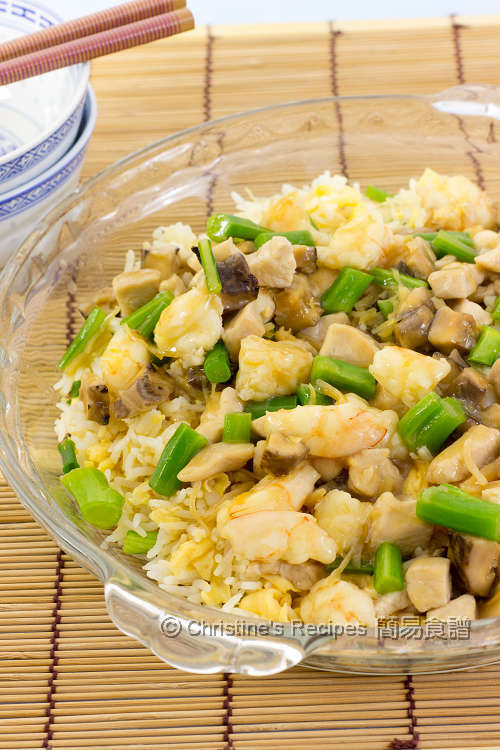 Traditionally, the chefs would put many expensive ingredients, like shiitake mushrooms, scallops, prawns, chicken and shredded roast duck into the fried rice. Thus, it’s not an ordinary fried rice but a luxury one. What makes this Hokkien fried rice different from other kinds of fried rice is that it’s finished with a thickened sauce cooked with all the expensive ingredients. You can tell it tastes wonderfully delicious. Leftover rice is perfect for making fried rice. But you still can use freshly cooked rice for making this dish. When cook rice, just add a bit less water than usual. Soak shiitake mushrooms and dried scallop in separate bowls of water until softened. Dice mushrooms and mix with marinade. Tear softened scallop apart into fine strips. Steam mushrooms and scallop in a wok over high heat, for about 15 minutes. Set aside. Cut each prawn into 3 sections if it’s too large. Season with salt and pepper. Set aside. Heat oil in a frying pan over medium high heat. Add beaten eggs and fry until it is half-way cooked. Add rice and stir fry well for about 10 minutes on high heat, until the rice is evenly heated. Transfer to a deep serving plate. Cover to keep warm. Add oil in the pan to cook chicken until cooked through. Set aside. Add oil and cook prawns till half-way through. Set aside. Saute shallot and ginger over medium heat. Add diced gailan stalks and stir to combine. Sprinkle wine. Pour chicken stock and water into the pan. Bring it to a boil. Toss in the chicken, prawns, mushrooms. When it boils again. Add scallop. Stir in the sauce and cook to your preferred consistency. Pour the sauce mixture over the top of the fried rice. Serve hot immediately. I used to marinate shitake mushrooms, then steam them before cooking with other ingredients. By using this method, the texture of mushrooms will turn to be tender and taste better. I learnt this trick from my mother. She cooks every dish of shitake mushrooms with fabulous taste. 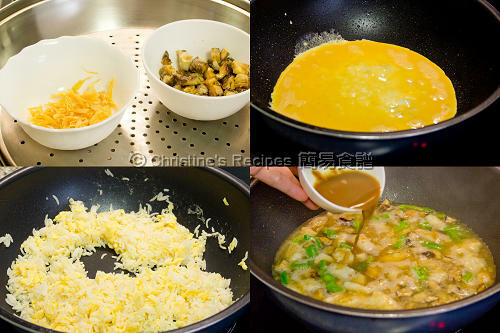 If you’re interested, please take a look at the previous combination fried rice recipe with tips on frying yummy rice. Mmmm, what a delicious dish! Loved the combination of mushroom in the fried rice. Thanks for sharing. I love this dish! Especially with lots of sauce! hehe. Love fried rice! This looks very tasty with the sauce. I have to give this recipe a try. Thanks for sharing! 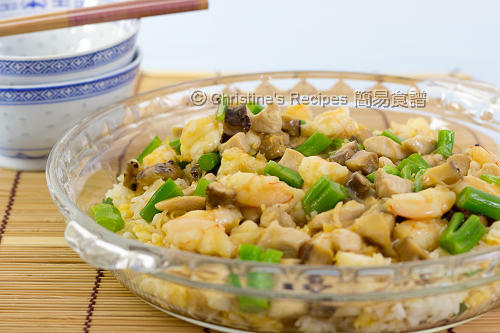 Here you'll find the chinese version of this recipe. looks really delicious. i'll try sonn, i've just bought shitake mushrooms.